VesselTracker is an AIS live vessel tracking system. Its functionally is quite like marine traffic web-based ship tracking service, but the main difference is that Vessel Tracker is the paid one. There are many users of Vessel Tracker because of its real time data for AIS live ship tracking, vessel movements, historical data, details for vessels’ owners and managers. They have a network of more than 200 AIS receiver stations that process at about 150,000 reports/minute which makes possible for subscribers to track more than 20,000 ships at each minute from anywhere in the whole world where they have coverage. Their services are specified to fit the challenges by firms and authorities that require a full review of worldwide vessel movements. This ship tracking website requires a free registration, which presents AIS live ship positions with delay at about two hours. If the users are just surfing unregistered, they will track the vessels with delay about 24 hours. Ship tracking system‘s paid accounts starts from 50 EUR/one user/one month, and lots of additional services which are available to the subscribers, and especially – e-mail and SMS alerts, available access from mobile devices etc. 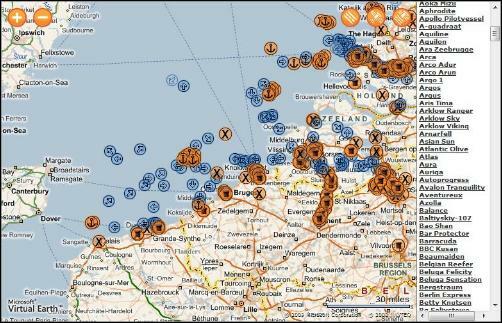 Vessel Tracker monitoring system supports more detailed alerts. Subscribers may specify an event to alert the arriving ships to the port or to the berth. Ships locations in real time. Electronic map which is web-based. Ships photos – more than 200,000 photos. Extra details for the vessel owners and managers. Internet access via mobile devices. Ship notifications – through mobile device, SMS or E-mail. Additional data for arrivals and departures. Historical information which includes the locations and berths that has been the ship to. Although Vessel Tracker is a little bit expensive it is a very good choice for those looking for a good vessel tracking system.